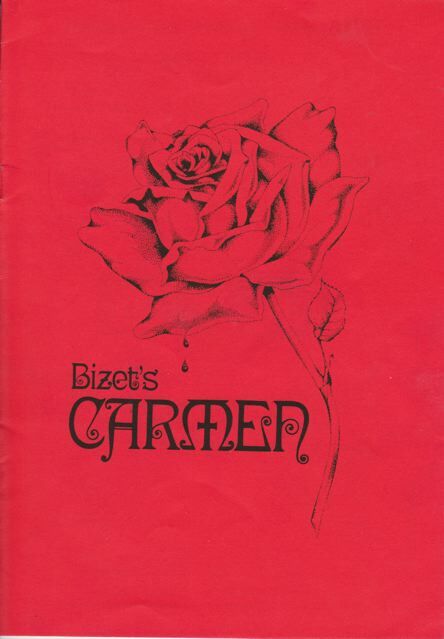 Any amateur production of Carmen will cause a lot of stress for the organisers - there will be a multitude of unforeseen problems, many members will claim vociferously that the opera should not be attempted, others will be devastated by the casting, new members with seriously operatic voices will suddenly appear, main soloists will suddenly become concerned about resting their larynxes and, hopefully, people will turn up to watch it. Many will also erroneously insist that it is ‘Grand Opera’. Two stalwarts of the Society died shortly after The Gondoliers, Fred Gange (Stage Manager 1964 - 68) and D Cecil Williams (MD 1947 - 70). The latest MD, Ward Gardner, was keen to continue in post but the Committee had doubts about Harold Dunford’s ability to produce Carmen and June Palmer was eventually selected for that task. Recruiting new members was thought essential, but an advertisement in the programme only attracted one candidate so appearing in the Southampton Show and Carnival plus contacting music teachers and schools was deemed a good way forward. Some of the current crop of members had their doubts about the wisdom of choosing Carmen and John Hoskins wrote a very strong letter, claiming that it would ‘ruin the Society’s reputation’ and then refused to have anything to do with the project. Dennis Gooch was concerned about the lack of rehearsal time but Dougie Huggins reported that ‘there was considerable excitement at the challenge and difficulties could be overcome if the company had a more down to earth approach.’ However, in November, the performers still had their collective noses in their scores and very little production had been achieved and cancelling the show was seriously considered. Despite complaints from the directing team about the casual approach of some and the general poor attendance at rehearsals, 25 children were gathered to be urchins and a parade of matadors was assembled to appear alongside the 44 members of the chorus. The day before the Dress Rehearsal, all seemed to be going well and then disaster struck! The Echo report explained, ‘Unfortunately, due to acute laryngitis, David Lewis was unable to play Don José though he acted and supplied the spoken words of the part. An admirable vocal line was, however, added from off-stage by Terence Wymer, who stepped in at short notice.’ Terence had sung the part seven years previously with West London Opera. Happily, the Society had better luck with the title role played by a lady making her SOS debut, ‘Hilary Carrington made a seductive Carmen, excellent vocally, giving the most convincing characterisation of the evening whilst Avril Botto was a fittingly sentimental and enchanting Micaëla. The supportive roles of Fransquita and Mercédès were vivaciously sung by Gillian Charnley and Hazel Kilham. Peter Robson as Escamillo was at his best vocally in the Toreador’s song, but became less impressive later.’ The critic did comment on the lack of warm-blooded passion though and blamed ‘ingrained G&S gentility’. Despite performing an extra performance in the form of a matinee and generating a lot of local interest, Carmen still made a loss of £289. 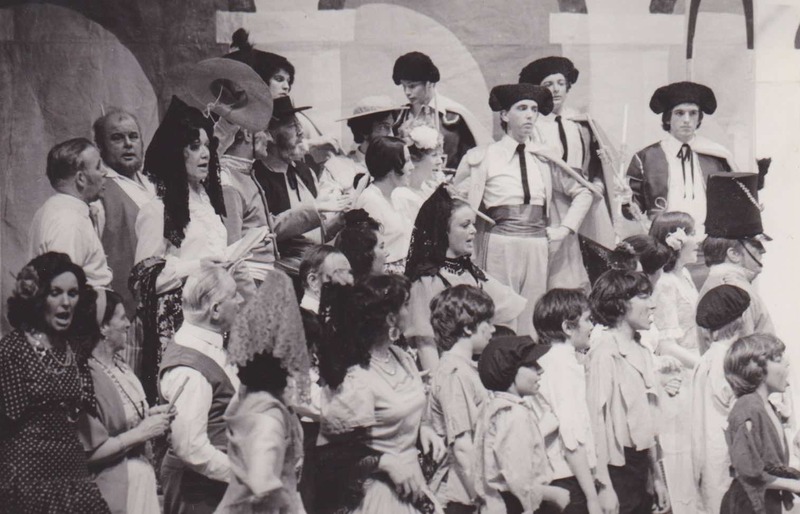 Some of the Chorus and Urchins greet Escamillo's procession - the only 'action' photo of Carmen 1978 in the archives.